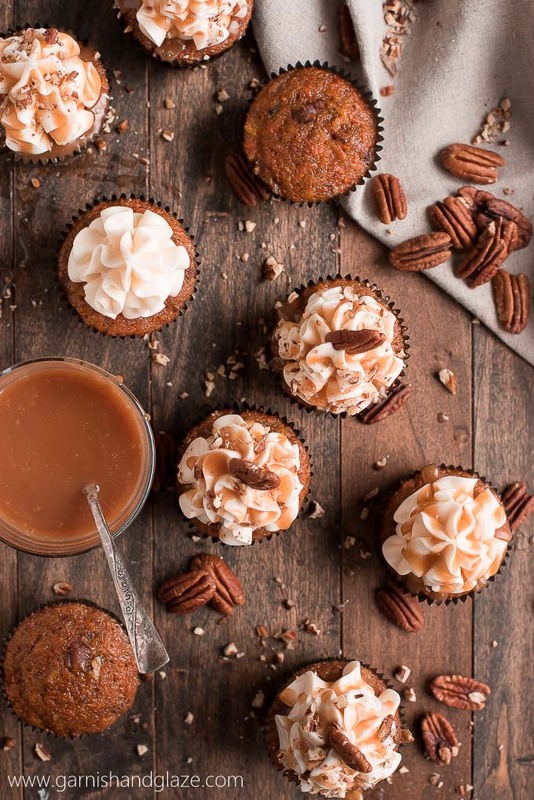 With a super moist cake and silky smooth cream cheese frosting, CARAMEL PECAN CARROT CUPCAKES are more than a dream come true. Pin it to your DRINK recipe board to SAVE it! I could eat carrot cake all year round! I love the cinnamon flavor and how moist the cake is. Plus, it’s a great way to eat more vegetables. Kidding! 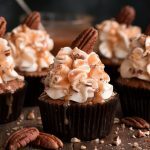 These Caramel Pecan Carrot Cupcakes are my absolute favorite (crazy since they don’t have chocolate) and well loved by all who eat them. 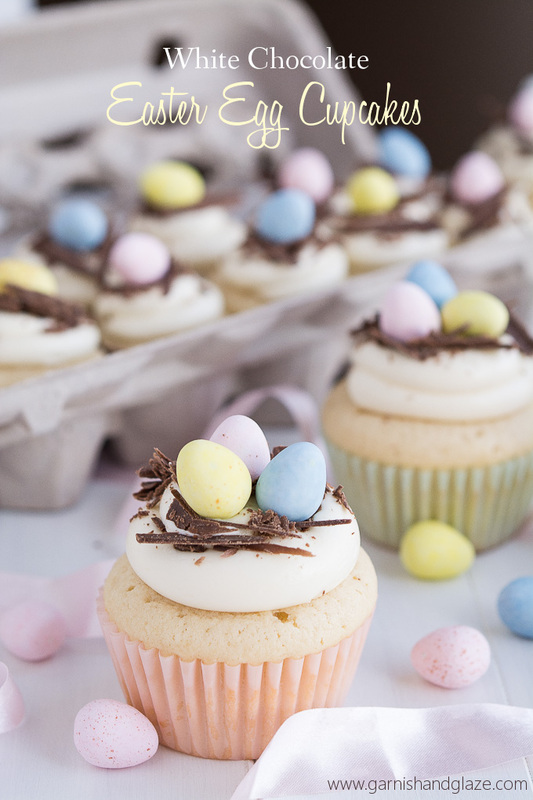 Deciding between these, Warm Caramel Carrot Cake, and White Chocolate Easter Egg Cupcakes for Easter is torture… so I make both! How to make moist carrot cake and take it to the next level? 1) FINE grated carrots- Use the side of the cheese grater that has the smallest holes. Yes, it will take an extra minute to grate the carrots but it’s worth it. It helps make the cake moister and less chunky. 2) Crushed Pineapple (or applesauce)- this adds to the moisture, sweetness, and flavor. Don’t leave this out! 3) Silky Creamy Cheese Frosting- Hello gorgeous! This frosting is so smooth and tastes like a million bucks. It uses less powdered sugar than normal since you’ll be putting caramel on top so this makes it less stiff and perfectly sweet. 4) Caramel- Oh yeah! 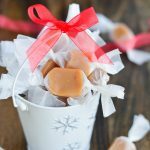 You can make homemade caramel sauce or use store bought caramel topping. 5) Toasted pecans- Toasting the pecans makes the nuts a little crunchier but also really bring out their flavor. It’s a must in my book. Can you see the moistness?! And because the carrots are FINE grated they’re as small as the cake crumbs. Perfection! And I doubt little kids would even be able to tell there are carrots in there. These look all fancy but they really are so easy to make. If you want a really ruffled frosting look all you do is hold your piping bag (fitted with a large closed star tip) vertically and squeeze as you slowly raise the bag up. Voila! 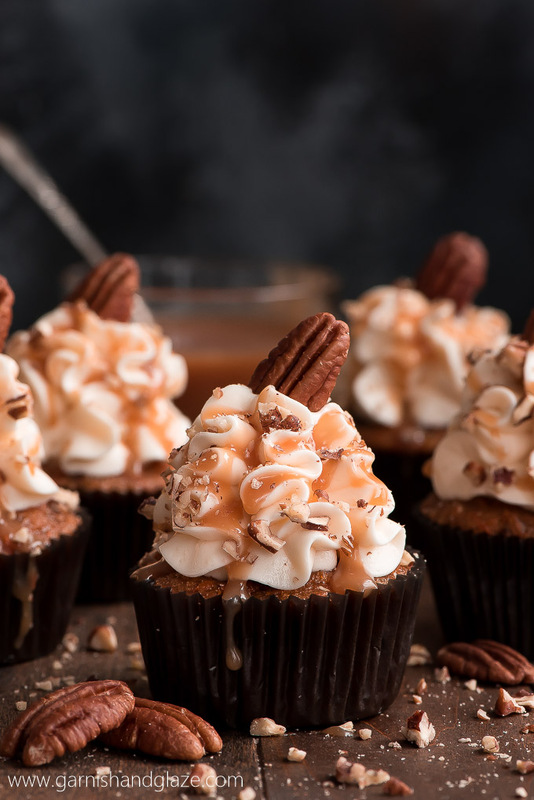 The ruffles catch the caramel and nuts perfectly. I’m pretty in love with these cupcakes. Are you? Preheat oven to 350 degrees F and line muffin tin with paper cupcake liners. In a large bowl, mix sugar, flour, baking powder, baking soda, salt, and cinnamon. Make a well and add oil, eggs, and vanilla and mix well. Stir in carrots, pineapple, raisins, and nuts until combined. Let cupcakes cool completely before frosting. With an electric mixer (hand or standing), cream butter, 2 1/2 cups sugar, vanilla, and salt together starting at a slow speed (takes about 2 minutes to come together). Continue to cream for a couple minutes until light and fluffy. Add cream cheese 2 ounces at a time and beat 2 more minutes (scrape down as needed). Add more powdered sugar if needed to thicken the frosting. Place frosting tip (2D or 1M) in a piping bag and fill with frosting. Pipe frosting onto cupcakes. For lots of ruffles, hold the bag vertical. Squeeze out the frosting as you slowly move the bag straight up. 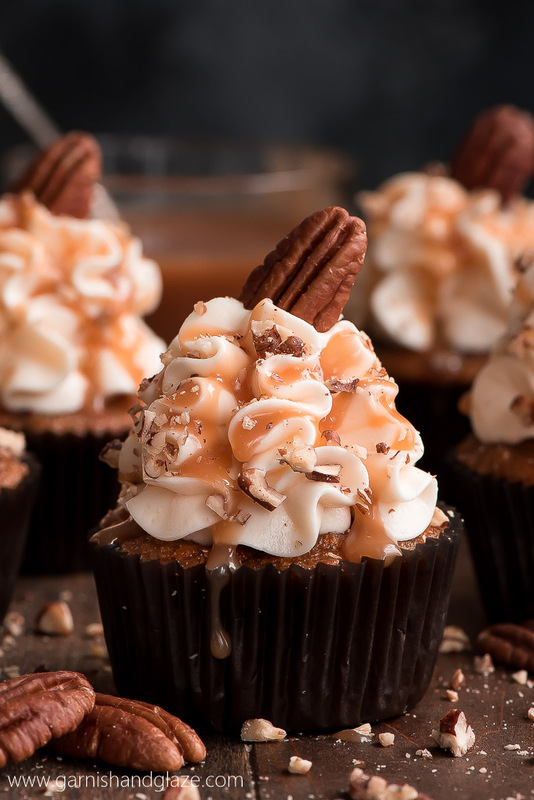 Using a spoon, drizzle the caramel over the tops of the frosted cupcakes. Sprinkle with chopped nuts. *To toast pecans: Spread on a baking sheet and bake at 350 for 7 minutes. Let cool completely before adding to batter. ***The frosting is made with less sugar due to the sweet caramel you drizzle on top. You can add more powdered sugar if you want the frosting more stable. To make this in CAKE FORM, double the cake ingredients (not frosting) and bake at 350 degrees F in a 9×13 inch pan for 50-60 minutes or two 9-inch round cake pans (greased and floured) for 30-35 minutes until a toothpick comes out clean. The 9x13 inch cake can cool in the pan but for the round pans, remove them onto a cooling rack after 20 minutes. Once cool, frost the top of the 9x13 inch pan or if making two 9-inch round pans place one cake on a platter, frost, top with the second cake and then frost the top and sides of the cake. These look absolutely amazing! 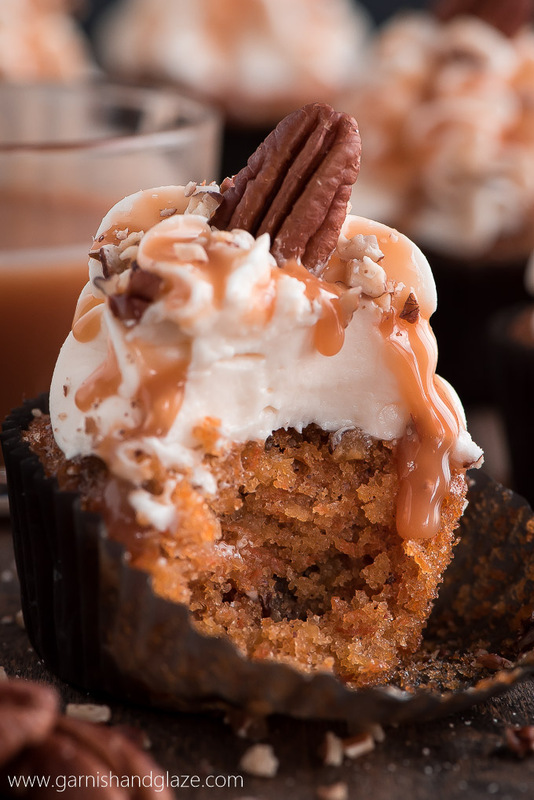 I was already planning on making some carrot cake cupcakes this week, mine might need to have a little caramel added to them too! Louisa, I’ll try to make these again soon and weigh everything. Sorry about that. These cupcakes are so beautiful! You have made the perfectly smooth frosting! These look amazing!! I love carrot cake so I will definitely be making these ASAP!! Thank you! Thank you Brandi! 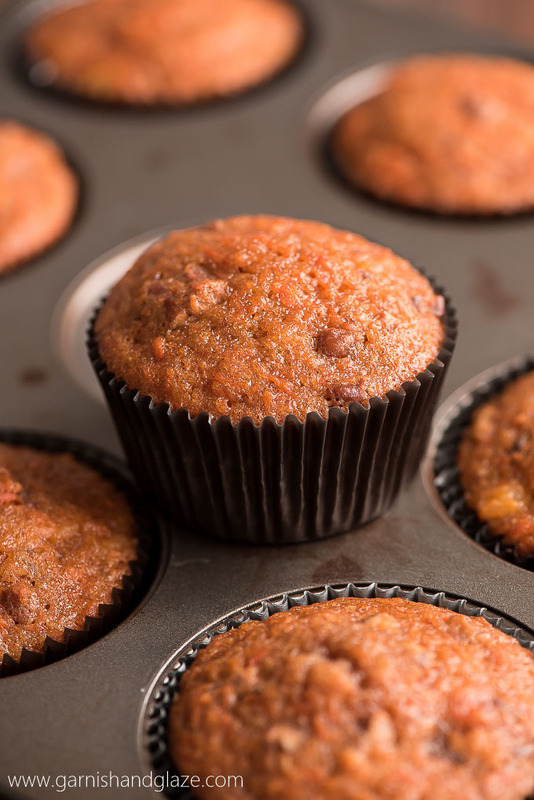 You can’t go wrong with these carrot cupcakes! Can you leave out the pineapple? Im allergic. I’m sorry you’re allergic. I looked up some substitutions online and found that some people just replaced it with more shredded carrots, pureed mandarin oranges, pureed peaches, grated apples, or canned pumpkin. Grated apples is probably the closest thing in flavor/texture to crushed pineapple. But let me know what you end up trying and how it turns out. Good luck! omg!!! I made the carrot cupcakes yesterday. Everyone raved about how moist they were. I will makethis recipe for now on. Ty so much. I wonder, could this be made into cake form with recipe as is?? There are 2 teaspoons of vanilla listed in the ingredients for the frosting. However, under instructions for the frosting there is no mention when or where to mix in the vanilla or any mention of vanilla for that matter. Should it be in the beginning where you are creaming the butter, sugar and salt together? Would like to know before I make this. I am so sorry to respond to your comment so late! I don’t know how I missed it. But yes, you add it with the butter, sugar, and salt. I updated the instructions to say that. Thank you! Enjoy! Thanks Adriana! I’m glad these were a hit for you! I found your recipe on Pinterest, and have made them several times now. I have to say I have never really been a big fan of carrot cake, but these are something else. They are soo delicious and moreish, that I need to be careful I don’t make them too often! Thank you, I love them, and so do my family and friends. Therese- I should really post a recipe for caramel sauce, huh? But for now, the Pioneer Woman has a really easy one that looks good: http://thepioneerwoman.com/cooking/2014/01/easy-caramel-sauce/ Enjoy the cupcakes! Polly- I’m so glad you found my blog! Sorry about the butter measurement. 1 stick is equal to 1/2 cup (just wrote this in the recipe) or 8 tablespoons. Or do I need to list the weight? It would be 4 ounces. Hope you like them! Thanks Jade! So happy to hear you like them! I made these today, doubled the recipe, but fortunately not the frosting because one recipe was plenty. However, I think next time I will cut the oil back some as I felt they were a bit oily. Otherwise, delicious!!!!! Hi, I was wondering if you toasted the nuts prior to using them or did you use them raw? Lana- I just used them raw. Thanks for the recipe! I have tons of carrots from my garden and my family just loved these! Oh my god!! These are delicious! My first attempt in making carrot cake and I will definitely make it again. I added lemon to the frosting and topped it with caramelised pecans. Everybody at work loved it. Thank you for sharing the recipe. I tried your recipe last night and the flavour of these carrot cupcakes was really good. I think I put plenty of cinnamon (2 tablespooons) and the color result a bit darker. I need to keep trying because the consistency was good but they didn’t rise well on the oven. Maybe they need a few grams of baking powder too. Thank you for sharing! Cheers from Mexico! is not much oil when double the recipe???????????? Sorry, I’m not quite sure I understand your question Libia but if you double the recipe you would double everything and use 1 1/2 cups oil. 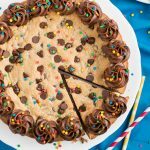 I would like to know how do double this recipe to make a cake of 2 9 inches pans. I would to make this cake by Thursday is my sister’s birthday and she loves carrot cake. Evelyn, The directions for how to make it into a cake are at the top of the recipe right before where the ingredients are listed. Your sister will love it! Hi, Is there any substitute we could use instead of the pineapple? Thanks! Lidia- I haven’t tried it but I think a grated apple (like gala) would work just fine. I was wondering if I want to make only 6-8 cupcakes, do I halve the recipes for the cupcake and frosting? Thanks for sharing the wonderful recipe. In the Uk we have self raising flour and plain flour… Which sort would this recipe use? My cupcakes have been baking for 16 minutes. They are still not done. Did you scoop and level your flour or did you spoon it into your measuring cup and level? It makes a big difference when measuring flour. I do the spoon/level. Emily- I spoon/level. Your oven, altitude, or the color/darkness of your pan can make a difference too. It’s fine to cook them as long as needed until the toothpick comes out clean. Let me know if you have any other questions. Can the cupcakes be made ahead of time & frozen? Can the frosting be made ahead of time? Do you use salted or unsalted butter? Megan- The frosting can be made ahead of time, just place it in an airtight container in the fridge and pipe it on the cupcakes when you are ready to do so. Can you make the cupcake ahead of time & freeze it? Do you use salted or unsalted butter? Megan- I have never frozen this cupcake or any cupcake but I think it would work. Fresh is always best though. And in all my recipes I always use salted butter. Hi! Just wondering if I would need to adapt the recipe in any way to make the cakes in mini muffin tins rather than regular size cupcakes? Thanks! I have been testing recipe off the internet for years and this is the first time that I’m leaving a review (Hope I am doing it correct 😉 ). The reason I feel obligated to post a comment is simply because these cupcakes were divine! Perfectly moist and tasty cupcake with a superb silky cream cheese frosting. By far my very fav cupcake. I didn’t have a caramel sauce that was thin enough for a nice consistent drizzle, however I am thinking to try crumbed sponge-toffee the next time. Also I used one whole walnut half on each cupcake instead of chopped. I could not and would not touch the recipe for the frosting or cupcake – Perfection! Stefanie- That is the best review ever! Thank you for making my day! 🙂 I’m so happy to hear you loved them as much as I do. The walnut half on each sounds beautiful. I’ll have to try too. Have a great day! These came out great! I’m not a big fan of carrot cake, usually, but I love pecans. These were moist and delicious! I wish I knew how to post picture, because they look great too! I’m so glad you like them! They are one of my favorite cupcakes. And about posting a picture, you can post on my facebook page. Alyssa, I’m sorry to hear your cupcakes didn’t turn out. The texture of these cupcakes should not be sponge-like at all. A sponge cake has zero fat (oil or butter) whereas this recipe has 3/4 cup oil creating a very moist tender crumb. Did you try to alter the recipe and decrease the oil? I think I used Hershey’s caramel topping but Mrs. Richardson’s caramel topping is really good too. I love baking and I found this recipe on Pinterest and my good friend wanted me to try baking it. I’ve never made carrot cake but I wanted to try. When I baked them though it seemed like some of them imploded on me. The centers dipped down leaving a bit of a hole. When I checked th with a toothpick some came out clean and others seemed really wet. The texture was really thick and oily to. I followed the recipe except did not use nuts or raisins. I baked it for 13 mins at 350 and turned the pans around and baked for another 3. I bake very often and never really had to much of an issue. I’m not sure if I undermined or overmixed or maybe didn’t bake them long enough. Is there anything advice you can give me on where I could have gone wrong. I had the same issue. Wondering where I went wrong…I’m wondering if I didn’t drain the pineapple enough and there was too much liquid in the batter? Made these and they were fantstic. I made them gluten free by using a cup of doves farm gluten free plain flour (less 1 tbsp which I swapped for buckwheat flour) and 1/4 tsp of xanthan gum, and no raisens. Came out really moist and tasty. I was just wondering if anyone has tried adding orange zest or similar to them and if it works? Nick- Thanks for sharing how to make it gluten free. I’m glad it turned out great with the substitutions. I haven’t ever tried orange zest in them but I’m not a huge fan of citrus baked goods. Could I use frozen pineapples? Or do I have to use canned? Dear Melanie, I just a quick question, the pecans that go into the cake mixture do you chop them or do they go in whole? All the best to you, H.
I usually opt out of adding the pecans in the batter but if you do choose to they should be chopped. I’ll fix that in the recipe. Thank you Melanie! So fond of your beautiful blog. Love, love, love this recipe. I made this earlier in the year in honor of my daughter who love to bake & started a baking business while in school and she loved making cupcakes. She was taken away from me in January & your recipe was the 1st cupcake I’ve made since she has passed away. Thank you for this recipe it has made me want to bake again. God bless you. This is the BEST carrot cake I’ve ever made. My family requested it for Christmas. This recipe fits perfectly in an 8×8 pan. The frosting is so yummy too. It makes a nice THICK layer on the cake. Merry Christmas! Thank you Maria! 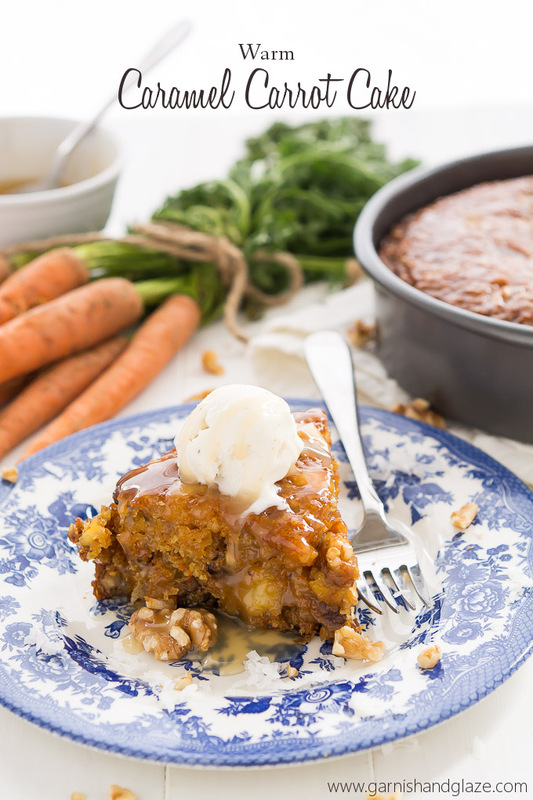 If you liked this carrot cake you’d like my Warm Caramel Carrot Cake too! It’s pretty similar. Have a Merry Christmas!!! Wow! These flavors sound amazing together! Definitely need to try this! These cupcakes look delicious! Can’t wait to try them. One question though, I don’t double up recipe if I’m making cupcakes correct? Cupcakes bake for how long, the full 50 mins? I apologize for the dumb questions! Thank you for sharing your recipe. These came out so good , I almost don’t want to give them to my friend for her birthday tomorrow lol But I’ll just make another batch. I don’t even need the frosting!! What brand of butter did you use? I use the Kirkland brand from Costco. It’s pretty good quality and an affordable price. Hey I’ve made your recipe plenty of time but my cupcakes are either sinking in the middle or over flowing. They are really good but I just can’t seem to get them just right. Can you tell me what I may be doing wrong to cause these problems. I made these for a Mother’s Day Dinner and I have to say they turned out amaazing! I did not change a thing! This is the best cream cheese icing I have ever made. The consistency and sweetness was absolutely perfect. I will definitely be making these again!! I made these today and they turned out GREAT! I followed the recipe exactly and made 17 cup cakes. The icing was very soft to pipe which was great and I put them in a cold spot after icing to “firm” up a bit. It was a very hot day today. You could not really taste the caramel on the cupcake but the caramel adds a lovely touch visually. If I wanted to double the amount of cupcakes it makes, would I just double the recipe? Thank you for the lovely recipe, i made it last night doubled up the ingredients as said i dont know if i had the right size tin though.. 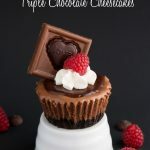 I used the 2 round ones i always use for a standard box cake mix.. It took longer to bake but eventually got there but just the top was abit crispy but the rest really moist. Do you think it was oven or the tins ???? Hmmm. I’m not exactly sure. If your pans were dark colored you should decrease the temp by 25 degrees. Did you have it in the middle of the oven? Maybe your rack was too close to the top? These have me in the mood for fall! They look so good! Thanks Eden! I’m so excited for fall! hi,fresh pineapple or canned pineapple is better? Sure! I haven’t tried it but I’m sure it’d be good. Melt it and use it as you would the oil. You’re cupcakes look amazing! I was reading your recipe and I’m just wonderint why you didn’t add baking powder, also can I lessen amount of oil for this recipe, will it affect the quality of cake? Thank you! Gie, Honestly, I didn’t think about it. I made this based off of my mom’s carrot cake and that’s how her recipe was and I liked it. I have made it with just 1/2 cup oil and it turned out great but I haven’t done less than that. These were absolutely delicious, a real hit with everyone in the office, definitely making again, thank you! Ive made this recipe about 20 times and it always came out perfect. But its been a few months since i last made it. Did it last night again but it kept making a huge hole in the middle after 15 minutes. Even made another batch and it did the same. That’s so weird! Maybe you forgot an ingredient? Or is your baking soda old/expired? You have baking power and baking soda listed in your ingredients but only add the baking soda. Please confirm if baking powder is needed or not. Jeanette, Yes! Sorry, you add it with all the other dry ingredients. Fixed! When you say 1 cup of flour how much grams would that be? My first 2 attemps were perfect but my last after all ingredients added it was hard i couldnt pour in the cake tins what could that be? Could you please tell me what oz size can pineapple you’re using? I really want to try this but don’t want to mess it up. 8 oz? 15 oz? I would like to use this as a sheet cake. One the size of your sheet cake carrot recipe for a crowd. Do you think I could use this recipe. I do like the idea of pineapple in it. I guess I would just need to double the recipe? Would it take the same time to bake as your sheet cake recipe? This carrot cake sounds and looks delicious. We love carrot cake and I want to use this for my husbands birthday. Sorry to just get back to you Brenda. Yes, just double this cupcake recipe and bake it according to my sheet cake instructions so at 350 for 24-26 minutes. The cake was delicious! Super moist. Made the cake last Friday. Today is Wednesday. There is still a small piece left and it still tastes fresh, moist and yummy. Thank you. Will definitely be using it again. Firstly: I just noticed that there are no quantities for raisins, but in the method you say “stir in carrots, pineapples, raisins, and nuts until combined.” Please advise on the quantity of raisins for the recipe. Thank you. Secondly: I am wanting to make these for a 100 year celebration and want to make up about 100 cupcakes, have you ever frozen these before frosting? I am also baking other treats and need to start early to be able to get through all my baking in time. I plan to frost the muffins the night before the function, once they are defrosted. Elizabeth, Sorry about that. The raisins are optional. I don’t use them anymore but it’s a half cup (just fixed the ingredient list). I haven’t frozen them before but they should do just fine. You have great write up, I always read your blog. and I must say you are doing good job, plz do write like this. I have made these twice! I love this recipe and I didn’t even eat carrot cake before this, but someone wanted a carrot cake and I decided to use this. Glad I did! Deliciously moist and great flavor! I feel foolish for asking this but what kind of sugar do you use in your recipe? I’ve looked at other recipes and they call for brown, would that be same in yours? Hi! I would love to make these carrotcupcakes! But I live in the land of grams, and was wondering if you could maybe translate the cups and ounces to grams, since I’m a bit afraid I’m maybe doing it wrong. Also what kind of sugar do you use? Granulated sugar of caster sugar? You would help me out loads! I want to start off by saying I love love love this recipe! It’s amazing!! I’m looking to make four 6″ cakes with this recipe, do you have any advice for me? Just grease and flour the pans and maybe even line the bottoms with parchment paper. It might take the same amount of time to bake since the cake layers will be thinner so just check with a toothpick and add more time if needed. Good luck!